Education is one of the most notable determining factors in a person’s future success. According to a Pew Research study released in May, 40 percent of employed millennials have a college degree. In order for Dallas County residents to effectively compete in the job market, they must have post-secondary degrees. Often times, the largest barrier that keeps high school graduates from attaining post-secondary degrees or certificate is money. 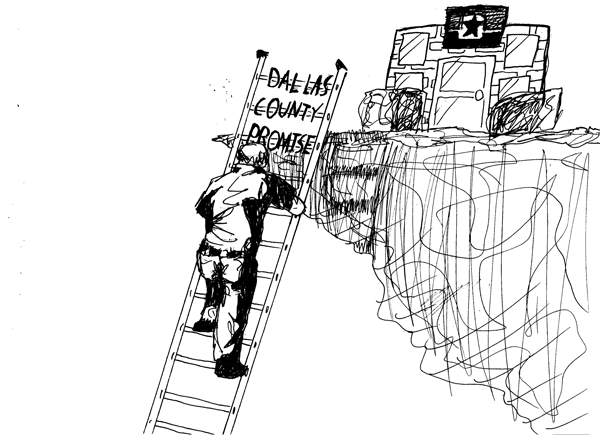 The Dallas County Promise program holds the potential to reduce the 17.9 percent poverty rate in Dallas-Fort Worth to unprecedented levels by offering free education to area high school graduates, all without spending one taxpayer dollar. Influenced by America’s College Promise, which died with the Obama era, and the Tennessee Promise, which has seen positive results, the Dallas County Promise is one of the best chances our area has to educate a vast number of students and residents. The Promise is a last dollar program, meaning students have to apply for federal and state financial aid, scholarships and any other financial assistance available before being awarded Promise money that draws from donations and investment interest instead of taxes. According to the U.S. Census Bureau, only 29.1 percent of Dallas County residents age 25 or older held bachelor’s degrees or higher as of 2015. We believe the Dallas County Community College District’s goal of having 60 percent of residents educated with post-secondary degrees or certificates is a noble one, and that the Dallas County Promise may be the biggest determining factor in the success of that goal. Everyone should be behind the Promise. An increase in the number of college-educated residents could mean lower unemployment in the Dallas area and a more prosperous economy. The only major problem that has been raised with the Tennessee Promise, which inspired the Dallas Promise, is that it does not aid non-traditional students working in blue collar fields. But the DCCCD’s Level Up program addresses that, giving non-traditional students a chance to return to school without worrying about tuition. By using the DCCCD Foundation’s donations and investment returns to pay for student’s tuition, it can help jumpstart higher numbers in residents who are better prepared to go into the workforce and have a better career for themselves. With the outstanding academic resources, solid teaching, and the number of degrees offered by the DCCCD, students at participating schools should take advantage of the Dallas Promise. This program has the potential to allow students to leverage their free education for careers and open up social movement in Dallas, closing the gap between rich and poor. For this reason, more high schools should be urgently working to secure a place in the program in these upcoming years. Not working to find a way into this program is a disservice to the students. We applaud the Dallas County Community College District for finding a way to create a free college option without gouging taxpayers or dropping the quality of the education offered at DCCCD colleges.